Yes with dogs they do both eyes at once since a majority of the cost comes from intubation/anesthesia/bloodwork etc which is all cash price. If I did one eye at a time I'd only save $1,000 and would end up having to pay for the other stuff twice totally well over the estimated cost of $5380. I have befriended a young lady via the internet after I found a video she posted on YouTube of her 1 year old Huskies surgery. She has been amazing at walking me through the process. So Luka will have both his eyes shaved down, and will wear cone for 3 weeks while he heals. I have taken a week off work to be with him after his recovery so I can make sure he tolerates the cone well. I plan on confiding him to the kitchen once I have to go back to work. I have purchased a Dog video camera in which I can see him, hear him and talk to him through it. It will alert me if there is movement. Its the best money I've spent! I will absolutely do a detailed update on his experience/ recovery. I will post some photos as well. I want to be here to help anyone who may have to go through this with any dog. This is the video of the young lady who's Husky has gone through bilateral cataract surgery. Looks like the first couple days are rough but he seemed to bounce back pretty fast and all was worth it in the long run. Just have to steel yourself up for that first little bit. the hair around his eyes came back pretty fast as well which will be nice. Glad you've been able to contact her. Having others who can walk you through what to expect I think really goes a long way to help out your nerves. There's a husky from the Empire State Snow Dog club that recently had the surgery. They've been posting pictures of him and it is really heart warming to see him enjoy having sight again...seeing squirrels, running around with confidence, not bumping into things. Do you know where I can find these photos??? The right eye surgery went beautiful- no issues. The cataract in his left eye was much more dense making surgical removal more difficult. Luka experienced Iris prolapse during surgery- meaning the iris (colored part of the eye) came out of Luka’s incision. She was able to fix this but the capsule that is supposed to hold the lens implant in place tore. Since it tore she was unable to place the lens implant into Luka’s left eye causing him to be Aphakic. Luka has lost his ability to accommodate near vision. He may struggle with depth perception. Also there is some fluid draining into the anterior(front) part of his eye because of this tear and the pressure inside his left eye is 40 (normal being 10-24) putting him at risk for Glaucoma or detached retinas. Luka is on 5 different eye drops 4 times a day. We go back tomorrow and if the pressure in his left eye is not down she is going to do an anterior chamber tap to release the fluid and lower the pressure. Dr Steele is hopeful the ocular hypertension will resolve over the next few days but he is not out of the woods yet. Main thing is to keep his eye pressure down. Dogs struggle with post operative inflammation WORSE then humans- resulting in having to be on an anti inflammatory eye drop FOR LIFE. Over time Luka’s right eye will accommodate for what the left eye cannot. So overall this is GREAT news. With all that said- THANK YOU to all who have prayed for Luka, donated towards his surgery and have been there for me. I'm not sure whether I should be glad that he's going to have good vision in one eye or sad that it didn't go completely well so he'd have good vision in both eyes ...since I've also had cataracts removed from both eyes, I have to wonder how *I'd* feel if it were me. Eye drops for life? Now I'm really glad that's not me, I had enough trouble with the eye drops for a couple of weeks!! It is good to hear that he'll at least have partial good vision, that's better than running into things and, as you say, he'll adjust. He'll still be able to see shadows with his left eye, yes?? Even that's better than nothing!! I wish things had gone better, @Aimee, and do have to thank you for the follow ups (which will continue, right?) so that others will have the wisdom of your experience. Yes so he has no near vision in his left eye- the Dr thinks he can see some distance but it’ll take some adjusting to with his depth perception. I’m worried about the eye pressure. But regardless his vision in his left eye is better than it was with the cataract so there’s the silver lining. Yes follow ups will continue I’ll try to get some photos but he’s sleeping right now so I’m going to let him rest. Main thing is he is alive and healthy - so truthfully I couldn’t ask for anything more. Thank you for the response- I wish things had gone better too. Just got back from Luka’s 1 day post op. Pressure is both eyes is now 11 with reduced inflammation. Over the moon with the news. Dr Steele wants to keep Luka on his eye drop regimen and recheck in - week. She said she is happy with his 1 day P.O. results. Lots of scary stuff to watch out over the next few weeks and the e-collar is a nightmare in a small condo. I took Luka for a pupaccino from Starbucks and he is now resting. I'm curious, how are you going to be able to keep him 'down' during the recovery period?? Well he has an e-collar on - he doesn’t like to move around with it too much. I took a week off to hopefully be able to get him through the most critical part of the healing process. It’s breaking my heart having to give him all these eye drops though. He turns his head away from me now. I feel like he hates me. if worse comes to worse when I have to go back to work I may just take him with me and set up his kennel. I’m not sure. I imagine that is a special feeling to watch him see like that again. It's amazing how different and how much better his eyes look after surgery. 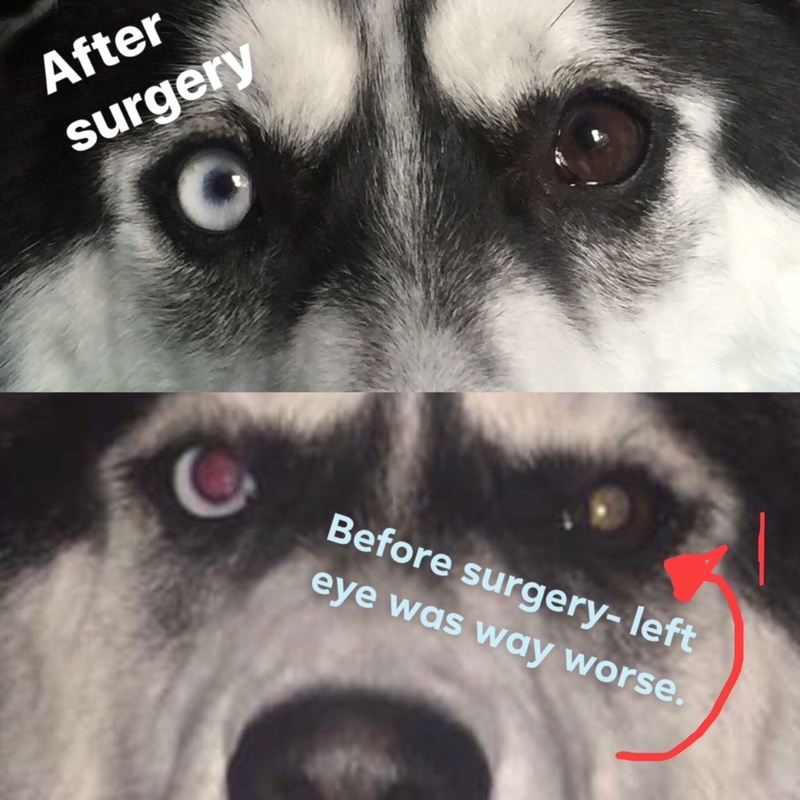 @lukathehusky -- aimee, I have to ask, since it's really hard to see with the brown eye, how's his vision there after the difficulties in surgery?? Thank you @aljones so much for posting the photo for me! I haven't been able to get to an actual computer until today. I cannot believe how clear his eyes are- even though the Blue eye cataract (right eye) doesn't look as bad My Ophthalmologist said Luka's vision was still like seeing through "Soup"
His vision is so amazing now you guys! My heart is so full- He can most definitely see without issues. He is chasing flies, bugs, cats (lol- every morning I walk him to see if the neighborhood cat is across the street and he sits there and waits for him) 1.5 more weeks with this cone. Eye drops are reduced now to 3 times a day. He is being so well behaved with his cone. Happy Friday everyone! Just wanted to let you know Luka had his 1 month post op appointment today. Things went perfectly! He is now out of his e-collar and can swim and return to normal duties. Only thing to be cautious of is him thrashing his toys violently. Which he does- so maybe no stuffed animals for awhile. I got to eliminate the antibiotic drops and one of the Glaucoma drops. We go back in another week for an eye pressure check then again in a month for his final. I am so so so happy- I dropped Luka off at daycare this morning so he could play and get some MUCH NEEDED energy out.